For the Paper Source setting, select where you loaded the paper you want to print on. Select the size of the paper you loaded as the Document Size setting. Note: You can also select the User-Defined setting to create a custom paper size, but you will not be able to use the Borderless setting, and the quality setting will be Standard. If you are printing a borderless photo, select Borderless. You can click Settings to access additional options for borderless printing. Note: You must select a compatible borderless paper type and size to print without borders. Check the borderless paper compatibility list for details. Select the orientation of your document. 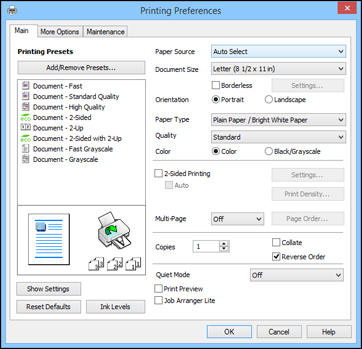 Select the type of paper you loaded as the Paper Type setting. Select the Quality setting that matches the print quality you want to use. To print a color document or photo, select the Color setting. To print text and graphics in black or shades of gray, select the Black/Grayscale setting. To print on both sides of the paper, select the 2-Sided Printing checkbox and select the options you want. To print multiple pages on one sheet of paper, or print one image on multiple sheets of paper, select one of the settings in the Multi-Page menu and select the printing options you want. To print multiple copies and arrange their print order, select the Copies options. To preview your job before printing, select Print Preview. To save your print job as a project that can be modified and combined with other print jobs, select Job Arranger Lite. To reduce noise during printing when you select Plain Paper/Bright White Paper, select On in the Quiet Mode menu.